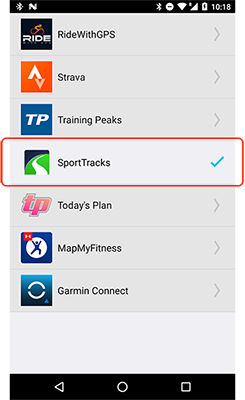 Great news for users of the ELEMNT bike computer: you can now set your cycling workouts to auto-sync with SportTracks! The same ultra-convenient sync feature that users of Garmin, Suunto, TomTom, and TrainerRoad already know and love is now a part of the ELEMNT. On top of that, it's available on both the iPhone and the Android versions of the ELEMNT app. Wahoo! UPDATE: SportTracks is also integrated into the Wahoo ELEMNT BOLT, and ELEMNT MINI. If you get this device, be sure to download the Wahoo ELEMNT app to use with it. Instead of having one app that can execute a vast number of tasks, Wahoo prefers the "do one thing, and do it well" model, and thusly, the ELEMNT has its own dedicated app. Most of the settings and functions of the bike computer are controlled through the app, including connecting it to SportTracks. Authorize the integration, and you're done. Painless. If you're in the market for a bike computer, the Wahoo ELEMNT offers some compelling features that help it stand out from the pack. If you use a KICKR trainer, it's a no-brainer. Not surprisingly, the ELEMNT offers tight integration with the indoor riding hardware that shares its name. But what does this unit offer everyone else? Aside from including three kinds of bike mounts (front, stem, and aero bar), the greatest draw of the ELEMNT is its no-nonsense approach to displaying data. Before a ride, you can easily select what you want to see in large, easy-to-read characters on the screen. As you pedal, you can hit one of its buttons to add more data to the screen, then hit it again to jump back to your main, large-character data view. The ELEMNT features built-in Wi-Fi, so when you return home and you're in range of your network, new workouts will upload directly to SportTracks. You don't have to fish a phone out of your pocket, enable Bluetooth, and pair to get files off the device. There's a lot more to like about the ELEMNT, including its mapping capabilities, customizable multi-color LED strips, text + phone call + email notifications (and the ability to turn these off while you're in the saddle), and, of course, its handy integration with SportTracks. The Wahoo ELEMNT has a "mobile-first" approach, which makes it a perfect match for SportTracks, as both were designed to operate in complete harmony with smartphones and tablets. We're excited about this integration, and we look forward to creating more and more partnerships like it, to give you as many automated training options as possible.